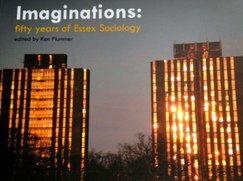 Studying sociology at Essex was a revelation to me. Imaginative academics inspired a journey into new territories of philosophical thinking, at time when ‘modernism’ was just becoming ‘post’. The sociology lounge and the deep smell of coffee infused our intellectual debates, mended broken hearts and offered a space for creating lifelong friends. Daily tensions of motherhood and study – struggling to get a baby on the bus and into the nursery before the lectures began. I managed to startle Ken (Prof Plummer) as he supervised my undergraduate project on urban witchcraft and it was Ken who recommended that I went on to study for my PhD. Although I did not have a vision of my journey’s end, I enjoyed the bricolage of postgraduate life. This entry was posted on November 28, 2013, 8:55 am and is filed under Alumni, Around the world. You can follow any responses to this entry through RSS 2.0. You can leave a response, or trackback from your own site.